Identify the PIC32 processor pins used for the LCD interface. Implement LCD control using the PIC32 Parallel Master Port (PMP). Understand handshaking requirements for interfacing two systems operating at differing clock speeds. How to interpret control flow and data flow diagrams. How to write a computer program using the C language. How to launch a Microchip MPLAB X project. How to implement a bi-directional parallel I/O interface. How to use delays to control signal timing. How to manage ASCII text strings. Microprocessors are the core element in an embedded system. Most embedded applications need resources or capability not available in the microprocessor. The additional capability can be provided by specialty electronic devices. Computer communications is necessary to exchange data between the microprocessor with these devices. The communications interface is provided using serial or parallel inputs and outputs. Parallel I/O implies multiple input/output operations at the same time whereas serial I/O implies single bit data exchanges. Whether the communications interface is serial or parallel, handshaking is required to coordinate the data exchange activity. Develop and test a collection of functions that allow text to be placed at any position on a parallel I/O character LCD following the DFD and CFD models presented in Unit 3. The LCD_puts function is required to process the ASCII control characters, which are described in Table 8.1. Character Liquid Crystal Displays (LCD) are low-cost electronic devices that are capable of generating visual displays consisting of alphanumeric characters and graphical symbols commonly used for embedded system human machine interfaces (HMI). Many suppliers of LCD devices are based on the Hitachi HD44780 LCD controller, and hence have a common hardware and software interface. 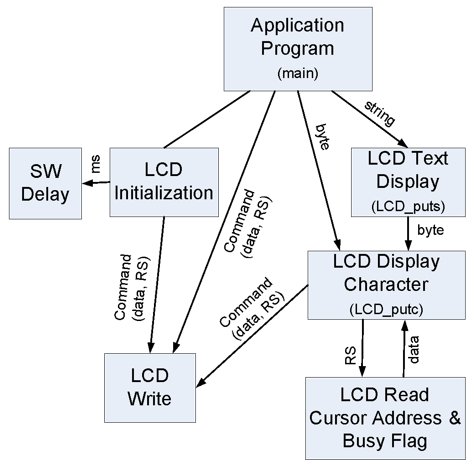 Some LCD devices have serial interfaces that use UART, I2C, and SPI communications1). These protocols are covered in Unit 4. Other LCD devices use interfaces consisting of four or eight data lines and three control lines2). Although the LCDs that use a serial interface require fewer processor I/O pins, the display controller IC is still based on the Hitachi HD44780, which uses 8 or 11 I/O pins. Hence, the serial LCD devices have an on-board microprocessor that translates the serial communications instructions to parallel I/O. The handshaking required to successfully communicate with the LCD on the Basys MX3 is representative of many common parallel interfaces. All LCD interface pin control will use PMP interface as described in the Unit 3 text. Write a library of functions to provide general capability to display strings of text, characters, and numbers at specified positions on the LCD display. 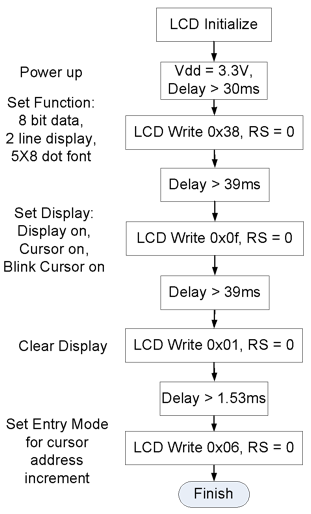 Initialize the LCD using the recommended sequence of instructions to write specific codes to the LCD at specified intervals, shown in the control flow diagram of Fig. B.2. Position the cursor in the display space (Line 1 or Line 2) where the next character is to be displayed. Write function(s) that write ASCII control and display data to the Display Data Ram (DDRAM). Translate the ASCII control characters into one or more C instructions for the LCD as detailed in Table 8.1. Write functions that write ASCII character data to the Display Data Ram (DDRAM). Write a function that will write a single ASCII encoded character to the display. Write a function that will write a string (array) of ASCII encoded characters to the display. Using the following program, develop a test project that will verify that the function LCD_puts(byte *str); correctly displays an array of ASCII text and control characters. Initializes a loop counter to a value of zero. Displays your name on the first line. Repositions the cursor to the eighth character position of the second line. Displays the value of the loop counter. Delays one second before repeating steps d through g.
TAB 0x09 Moves cursor position 4 places to the right. If this action places the cursor beyond the end of Line 1, the cursor will be placed at the start of Line 2. Generate a project in MPLAB X. Copy the config.bits file to the project directory. Open three new C files: main.c, lcd.c, and swdelay.c. Open two new header files: lcd.h and swdelay.h. Generate the contents of the main.c file for the initialization code and the infinite loop. In swdelay.c, generate a function prototype for the msDelay(unsigned int dly); function. Copy the software delay function from Unit 2, Listing 7.3 to swdelay.c. In lcd.h, generate function prototypes for the five LCD functions shown in Fig. B.1. Generate the code for the five LCD functions in lcd.c. Write a problem statement that lists the requirements. Determine what elements of the Basys MX3 board will be used. List the processor hardware resources that you will be using in this design. Generate a data flow diagram that identifies tasks (functions) and the information that needs to be passed between these tasks. Using the DFD and the multiple CFDs shown in Appendix B, develop and test the functions that will initialize the LCD and display single characters and a string of characters. You should use the? software delay function used in Lab 1b. Using the DFD and the multiple CFDs shown in Appendix B, develop and test the functions that will initialize the LCD and display single characters and a string of characters. You should use the software delay function used in Lab 1b. Demonstrate that the test program developed for requirement 4 executes correctly using the test string “\0141234\0115678\0119ABC\r”. Demonstrate that the test program developed for requirement 5 executes correctly. What are the advantages of using the PMP interface over the bit-banging interface? What are the advantages of using the bit-banging interface over the PMP interface? How would the LCD display be affected if the application described above is combined with an application that uses interrupts? What is the maximum rate at which characters can be written to the LCD? 2 Line 16 Character LCD Data Sheet, http://www.lcd-modules.com.tw/upload/web/SC/SC1602B.pdf. Figure A.1. LCD connection schematic diagram for Labs 3a and 3b. Figure B.1. Data flow diagram for the LCD control. Figure B.2. Control flow diagram for the LCD initialization. Figure B.3. Control flow diagram for LCD Write operation using bit-banging. Figure B.4. 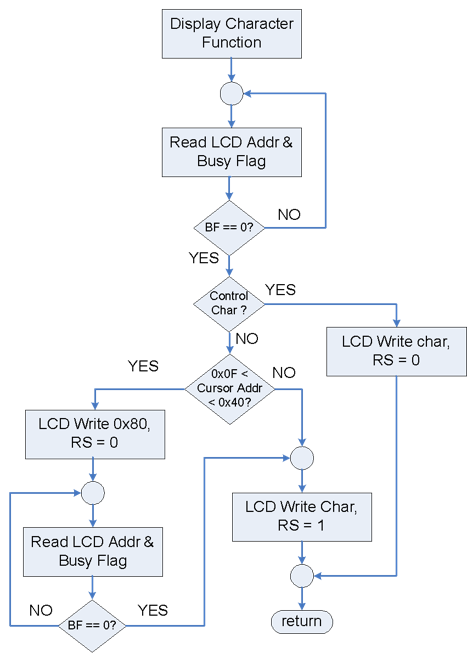 Control flow diagram for LCD Write operation using bit-banging. Figure B.5. LCD display character control flow diagram.